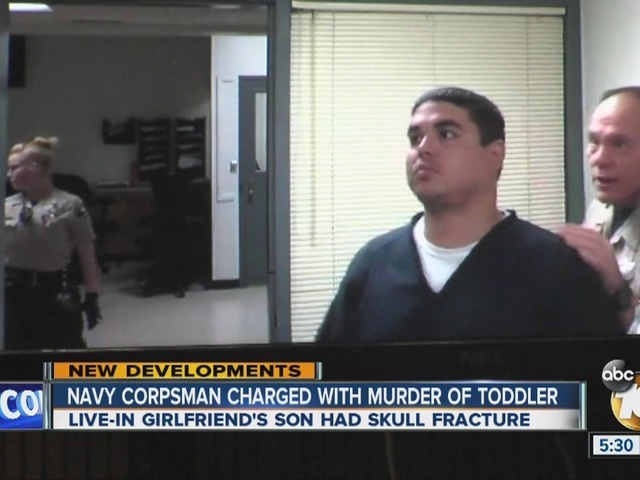 EL CAJON, Calif. - A Navy corpsman accused of killing his live-in girlfriend's 19-month-old son, who was found fatally injured last week at their Alpine apartment, pleaded not guilty Tuesday to murder and child abuse charges. Brett Brown, 29, was ordered held without bail in connection with the death of the young child named Lucas. Brown -- who was on military leave at the time of the child's death -- was arrested last Thursday at a Shelter Island hotel. About 1:45 p.m. on Jan. 11, deputies responding to an emergency at a rental residence in the 2100 block of Arnold Way found the gravely injured boy, said sheriff's Lt. Kenneth Nelson. Brown -- who had been watching Lucas along with his girlfriend's other child and two of his own from a former relationship -- reported that Lucas had been hurt in a fall. The toddler's mother was at work at the time, authorities said. Paramedics took Lucas to Rady Children's Hospital, where he died two days later. Detectives investigating the fatality decided that the trauma the boy suffered was too severe to have occurred as Brown described it, the lieutenant said. Deputy District Attorney Chantal de Mauregne told Judge Patricia Cookson Tuesday that the victim had multiple skull fractures and two broken bones -- one each in an arm and a leg -- that had been healing. Lucas -- the youngest of the four children who lived with Brown and his girlfriend -- also had bruising on his body, the prosecutor said. Brown faces 25 years to life in prison if convicted. He will be back in court Feb. 29 for a readiness conference.